What’s this, you ask? Smuggler’s Bounty instead of Loot Crate? Allow me to explain. I mentioned in the last Loot Crate review that this month’s crate didn’t really interest me. And since there’s a brand new Star Wars movie on the horizon, I also thought it would be a good time to go back to Smuggler’s Bounty. For those who don’t know about this more specific alternative, it’s an official bimonthly crate from Funko featuring all exclusive Star Wars products. Each themed crate includes a patch, a pin, a t-shirt, and at least one Funko Pop Figure, with other items available as well. September’s theme was Jedi. Was this a good time for me to come back in? Let’s find out. Until I did some more research, I thought it was odd that this was the first Pop Figure of this character. She’s one of the minor (but still named) Jedi appearing in Episodes 2 and 3. She’s a Twilek, so she’s more interesting to look at than Obi-Wan, and more unique. She isn’t a fan favorite or anything, which leaves this box somewhat lacking in awesomeness compared to others, and that’s quite a shame. But at least there are two Pop figures in this one, right? It’s better than the mug we got that one time. It’s good to see them branching out and doing brand new characters instead of more variants too. 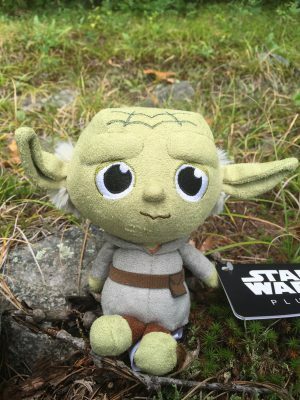 Our last non-routine item here is a plush Yoda. Yoda is a nice character and all, but I really don’t see the value here. It’s not a collectible, and it isn’t cute or anything. I suppose I would still take this over socks or a lanyard, I guess. There isn’t much else to say here. The shirt this month is one of a few variants. Each one has a Jedi character in grayscale, lit up in the color of their lightsaber. 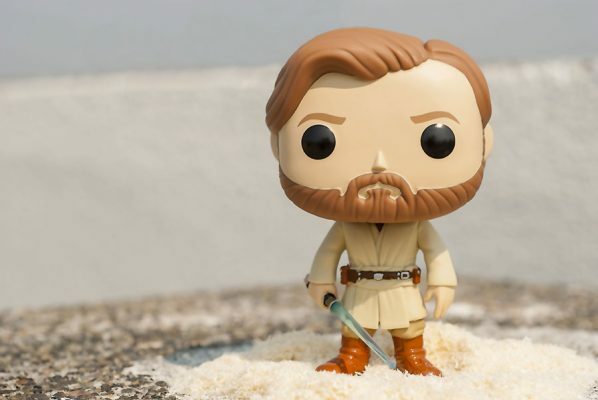 The versions I’ve seen so far feature Obi-Wan, Qui-Gon, and Yoda. I really like this design. It’s stylized in a unique way, and the lightsaber shine is striking. 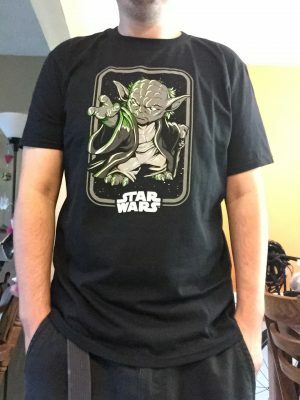 The shirt is also not overly branded, only featuring a simple Star Wars logo. I haven’t actually gotten mine yet, so I don’t know which I have, but I’m hoping for Yoda. I definitely like him more in shirt form than plush form. I do wish they included characters like Kit Fisto and Plo Koon on these shirts too, though. What can I say, the lesser known characters look cooler to me. The patches and pins always have the same basic design for Smuggler’s Bounty; it’s just a question of who’s on them. The patch this time features Qui-Gon Jinn, and the pin features Plo Koon. It’s good to see him getting some love, but I do wish they’d mix up the designs of the pins a little bit. As for the patches, well, I don’t have much use for them regardless. So, was this the best month for me to return? Probably not, especially if you look at the contents of some of the boxes I skipped. I do like the shirt, though. 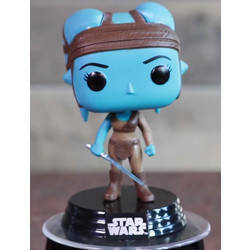 And it’s nice to finally have a Pop figure of Aayla Secura after all this time. The next box is coming in November, and as one would expect, it’s based on The Last Jedi. Go to www.smugglersbounty.com. Next month I’ll be back with the usual Loot Crate.